Modern Metal styles such as Metalcore have deep and old roots. The foundations of the style were set in the 90s, when bands as FEAR FACTORY, MESHUGGAH, MINISTRY, SEPULTURA, SOILWORK, IN FLAMES, PANTERA and some others started to influence bands that go in a way where guttural grunts and clean melodic vocals, technical (and almost robotic) guitars, and a technical and solid rhythmic kitchen began to be the musical model that many should work with. So we can say that modern Metalcore appeared in the end of the 90s, with such pioneers as KILLSWITCH ENGAGE, SHADOWS FALL and ATREYU. Today, the style has many followers. 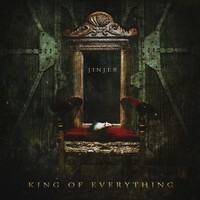 In the middle of this Metalcore flood, there are some good bands, such as the Ukrainian quartet JINJER that is releasing their new album, called "King of Everything." The main different elements of their musical work are some Jazz and Reggae touches in their identity. It's brutal and nasty, but with that melodic modern aggressiveness. It's different, and maybe the fans of the style could give them a chance, because it's really good, besides the quartet has a long way to go. The sound quality of "King of Everything" is truly good, loud, clear, aggressive and heavy. The producer did it in such a good way that all these important elements are in a good level of balance. So be prepared, because the band is really aggressive, even in their melodic moments! Their best moments can be heard on the fast and heavy "Captain Clock" (with some blast beats that comes from Death Metal, and very good clean vocals, showing that Tatiana has a melodic aggressiveness in hear clean tunes), the rhythmic changes on "Words of Wisdom" (the technique show by bass guitar and drums is excellent), on the well worked harmonic structures of the nasty and violent "Just Another" (a great work from guitars, along with this very good changes on the rhythm), the experimental "I Speak Astronomy" (filled with very good clean vocals and with some Jazz tender moments), and the bulldozer weight shown by bass and drums on "Dip a Sail". But the entire album is good. They can do better than what we hear on "King of Everything," but by now, they are pretty good.